Of the many possible applications for paving stones, garden pavers are among the most interesting, due to the potential stylistic and thematic connections between the many paver sizes, shapes, colors, and designs of paving stones and the garden’s inhabitants and style that you’ve already set up. Garden paving stones can complement many gardens in aesthetic design while also increasing the functionality of the garden, either by providing walking spaces or by protecting the valuable plants inside it. Garden paving slabs and stone are essentially equivalent to that used for other projects – driveways, walkways, pool decks, and the like. The only difference is in its functionality in the garden itself. 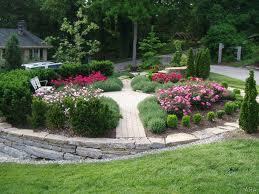 The walkway, patio, or garden edging pavers both contribute to and are affected by the design of the garden. Using outdoor pavers not only can protect and beautify the fruits of your hobby, but they can also increase your enjoyment of the home itself, as well as represent a financial investment since the brick, if installed correctly, can increase the property value of your home. Note that there are many kinds of garden paving stones available; each has its own pros and cons. The three main categories of pavers include brick, concrete, and natural stone; a comparison of these materials has been made elsewhere on this site, in particular in the comparison of stamped concrete vs pavers and other paving materials. The major difference you’ll see, aside from looks, is price – landscaping with stone, like cobblestone for instance, will be much more expensive than using manufactured options like concrete. Pavers, as discussed elsewhere, are strong and durable. You won’t have to reinstall them for many decades as long as they are properly installed. They will stand up to the rigors of their environment, especially if this includes close contact to soil and gardening chemicals. One advantage of pavers that is important for garden applications is the balance they strike between smoothness and roughness. They are not too rough as to be uncomfortable if one walks on them with bare feet but they are also not too rough as to be worn down by the elements. Their roughness also makes them less slippery when wet – an important feature if they are installed around pools or gardens. On the other hand, many concrete paver brands retain their smooth finish over time, keeping them beautiful and new looking for many years. Another good reason to install these pavers is if you park your car, machine, or other equipment in the garden area. Driving and parking over grass and dirt will eventually create a messy area, one that could clash with the beauty of your garden. There are many dedicated grass pavers that are subtle, environmentally friendly, permeable to water, and durable to stand up against any kind of traffic. If you have a high traffic garden (in terms of feet or wheels) you may benefit from installing these kinds of pavers in addition to the typical walkways, borders, and the like. As stated above, garden pavers can be used for many applications in your hardscape and landscape. One potential application for these pavers, and perhaps the simplest, is their use as garden edging. These borders made from landscape pavers can delineate and protect the boundaries of your garden. This will prevent people (or animals) from walking through fresh planted gardens. In addition, the pavers can be used to mark off particular sections of the garden – and the color and style you choose for each section can nicely complement each section as you see fit. Functionally, the garden edging can prevent dirt and mud from escaping from the flower bed and mucking up your patio or walkway (or your yard or garden itself). Aside from simple edging, you can mark off the boundaries of your garden by installing walkways to mark off the garden and provide a place for visitors to walk; another strategy is to install walls or retaining walls if a more heavy duty solution is needed, or if a wall would fit better with the theme you are trying to create in your yard. You can thus use these walls as part of your garden fencing ideas – if you need to keep people or critters out of your garden, you can use beautiful and regal walls instead of or in addition to the normal fences you might use. You can use the same garden brick for flat projects (walkways and patios) as you can for walls, so you won’t have to worry about mixing and matching brands. Of course, your garden edging ideas don’t simply have to be purely functional – don’t forget about the aesthetics of your garden as well as the experiences it can provide to you and your guests. If you have a large garden, installing a walkway or patio can help you create a special garden space, through which you, your friends, and family can travel or simply relax. Your garden can thus be more than functional, but also aesthetic – you can create a space for contemplation, relaxation, or conversation with the judicious use of a garden pavers walkway or patio. You could also create a central space in your garden to hold parties or bar-b-ques. The only limit is your imagination. Don’t forget that there are other paving options at your disposal besides pavers. You can also use stepping stones to fulfill many of these functions; garden stones are cheap and easy to install, so they make a great DIY project if you want to lay down a hardscape quickly. You may also find rubber pavers that may be of benefit to certain garden applications. Note that all decisions should be made in concert with professional landscapers and gardeners who may be able to give you additional backyard landscaping ideas in addition to those you’ve read here or thought of yourself. The more eyes and ideas that come into a project, the better the project will turn out – as long as you have the funds to pay for these services, of course. Overall, installing pavers, either in a small or large project, may be a great addition to your home and garden. If you are installing the concrete pavers yourself, make sure you follow the directions, and pay special attention to the problems of grading, as you want to make sure water leaves the garden area in the right ways – you don’t want any flooding to wash away all your hard work. If you’re having a contractor install them, make sure he or she knows the specific needs for garden pavers installation, and that they have experience in that particular application. Note that the cost for installing these paving stones will be similar to what you’d pay for any hardscape project, like walkways, driveways, and the like, though you may have to pay more if you need to protect your delicate creations during the process, as this will require more effort and time. You can also lower the overall price you’ll pay for the installation if you lay the material yourself; you can also save money if you find cheap pavers for sale, a subject that is discussed in that link. This entry was posted in Project Ideas and tagged des, design, garden edging pavers, garden pavers, garden paving, garden paving stone, garden paving stones, landscape pavers, projects by Will Grander. Bookmark the permalink.